NOTE: Mike Lorrey is an advisor to trive.news and is a past contributor and moderator for WUWT. In Part 1 I talked about how the Trive system works in its adversarial system of on-chain peer review and challenge that is incentivized by bounty rewards. In the comments to the last piece, there were a number of questions about blockchain in general that can be better answered elsewhere, but suffice it to say, proof of work, delegated proof of stake, and other consensus algorithms that solve the Byzantine Generals Problem electronically have given us a new world where people of any nation can create institutions of trust within blockchain, as smart contracts that execute automatically, fairly the same way for everyone, every time. That’s not as big a deal to most of us who have lived in nations with fairly stable and vibrant civil societies, where we have grown up trusting our governments, courts, banks, money supply, and even, for the most part, the news media, to be fair and balanced toward all. Most nations do not enjoy such advantages and are in development traps that perpetuate global poverty specifically because of a lack of institutions of trust. We are seeing how through globalization, the mistrust and corruption of the developing world has been seeping into the developed world along with immigration, trade, etc. We can no longer trust our media. The courts are a mess of bias, police are blatantly abusive of citizens unless they are provably elites, elections are being stolen by voter fraud. Lastly, peer review has become corrupted as well, particularly in climate science, but the amount of scientific fraud in the world has been climbing in most every field at an alarming rate. Fully half of all medical research papers are deemed to be fake, as one example. In a world where individuals do not trust each other, all can trust a smart contract on a blockchain. All data stored on the blockchain can be audited for validity, and cannot be changed. With Trive, the system of weeding out fake news works pretty well. For the philosophical, it is obvious we cannot determine the actual capital T TRUTH since humans are all fallible and science is a process of gradually finding some increasing degree of truth that is sufficient for our present understanding. However we can weed out falsehood. I’ve demonstrated how this process works, but the real questions are: who pays for all this, and why should the world care what happens on a blockchain? While not implemented yet, the Trive system when fully realized will use a cryptocurrency called the Trive token as a form of money to incentivize the system. Anyone will be able to buy Trive Tokens on a number of crypto exchanges from other users or directly from Trive.news. These tokens will sit in your Trive wallet on the plugin, for you to submit as a bounty on any story you want to be trived. Question: Why can’t mister fat wallet just buy a ton of tokens and pay a bunch of people to pollute the system with crap? This questions addresses what we call a Sybyl Attack, where a group of individuals, or bot accounts, are used to overpopulate a system to bias the course of its blockchain. This is a valid concern when a blockchain is young and has few users. However once it has grown sufficiently, the public as a whole always exceeds the resources of any individual Sybyl attacker. One reason I’m publishing these stories on WUWT is to get the word out to the skeptical public so that YOU can be part of the solution. But Trive is also building in some heuristics to spot Sybyl attackers: people using the same IP address or MAC address, to submit stories, for instance. People using the same wallet addresses, or picking up the stories submitted by the same person regularly. There are many heuristics for discovering this sort of fraud and weeding it out of the system, blocking the participation of proven Sybyl attackers. But this problem isn’t new in climate science. The promiscuity issues we saw in the Wegman Report years ago demonstrate that climate science was already captured by a sybyl attack in the scientific press, thus this is already a problem in climate science and how its peer review became pal review. We cannot possibly do any worse than has already happened, by enlisting the public to participate, and we can in fact recapture climate science from the sybyl attackers on the Hockey Team and their allies through the use of Trive. However once you accept that the fact finding process is provably fair, the question is: So what? How does this impact fake news? Once stories have been trived, and fake news articles rated as fake news, the plugin then has an effect on what you see on news sites. Looking at Huffpuff, or Slate, or NYT, or New Scientist with a browser using the plugin, stories that have been Trived to be fake have their text faded out. You cannot read those stories, or its very difficult to read the faded text. Stories that have survived triving and are not fake remain fully endarkened text as their formatting requires and even have a rating of veracity. Stories that have not been Trived will be indicated, and you can see the size of bounties on each untrived story. So you will see the more or less TRUE stories, and the FAKE stories will be faded out, causing you to be more inclined to read the stories that you can actually READ. This means that readers will be more likely to read true stories than fake stories, and as a result, to see advertising on true stories and not on fake stories. Once this happens, advertisers will start demanding of publishers that they should only pay for ads that appear on true stories, thus demonetizing fake news, and training the media through this carrot and stick approach, to focus on the truth. News organizations that are competitive with each other for readership will submit each others stories to be trived, hoping that their competitors lose readers as a result, and advertising dollars. Best of all, we know that Chrome uses browser behavior to inform the Google search engine how to present search rankings, so by fading out fake news, people will only browse to real news, and googles search rankings will be corrected as a result. 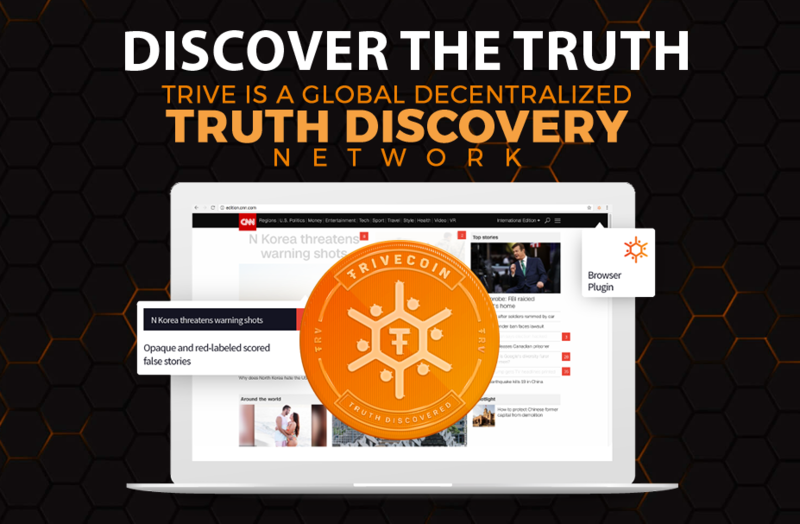 Individuals worldwide seeking to earn money can participate in Trive at researcher, challenger, or jury witness levels. The more participants, the less possible it is for a Sybyl Attack to succeed. The more that participate, the more likely that the truth will win out. And as individuals earn Trive tokens, they can sell them on crypto exchanges, or cash them out through their trive wallet, into other crypto, or fiat money like dollars. The Trive economy thus comes full circle not just on the researcher side but on the user side, producing a more truthful news media all over, not just with regard to climate science.